May 26, 2018 May 25, 2018 Dan O. Girls are weird. Aliens, not so much. Enn (Alex Sharp) is like most teenagers: Sexually frustrated, angsty, and chock full of hormones. That’s why one fateful night, he and his buddies decide to check out this weird party where all sorts of odd folks are at. There are plenty of girls and guys there, but for some reason, everyone’s a little strange and Enn and his pals don’t know what to make of it. However, Enn strikes up a conversation with Zan (Elle Fanning) and instantly, the two hit it off. For some reason though, Zan has never heard of punk rock, or music in general, which leads Enn to take her on a crazy, wacky, and wild adventure of rock, of roll, and plenty of punk. After all, it’s Britain in the 70’s and if there’s anything that there’s a lot of (with the exception of poverty and misery), it’s angry, thrashing teens who don’t give a f**k about what the rest of society says, or thinks. But Zan has a weird secret and it may be a deal-breaker for young and ambitious Enn. So far in his career, John Cameron Mitchell hasn’t made a dull, or even bad flick. However, he comes dangerously close here with How to Talk to Girls at Parties and it’s a shocker. For one, the material should be right up his alley; a nutty mixture of sci-fi, romance, music, comedy, drama, and general weirdness that never seems to know what to do with itself or when to slow down. But for some reason, the movie never materializes into being one, cohesive whole, or even making much sense. In a way, it’s not supposed to make sense and that’s fine, but the movie goes through so many changes, peaks and valleys, it almost feels like Mitchell himself is confused of what to do with this material. He enjoys being weird, he enjoys being loud, he enjoys being crazy, but altogether, and for some reason, it doesn’t fully gel. The movie’s never boring, that’s for sure, but sometimes, it can be hard to place down exactly what it’s trying to do and why, which for someone like Mitchell, is a disappointment. Still, it’s not the awful mess you’d expect. Next time, just give me this and only this. Thanks. If anything, it’s just a mess that has way too much shouting coming from too many mouths. It’s something that Mitchell dealt with before in Shortbus, but he handled it so much better with a smaller, more contained-scale. This one here, is not as balanced, or small, or contained, or even quiet – it’s big, bold, loud, and aggressive as hell. Problem is, it never fully snaps out of that and almost seems like it’s just shouting so much that it distracts you from the fact that it truly has no idea what it’s even yelling about in the first place. And there’s nothing more frustrating than a movie without much of anything to say, let alone, one from a talented film-maker like Mitchell. But here we are and it’s hard to consider. Even if there are bits and pieces of true inspiration (every scene with Nicole Kidman’s wacky punk rocker is gold), the movie always seems like a weird hybrid of sci-fi and romance, yet, never fully connects the two. It’s so concerned with being strange, that it never feels like it actually wants to be strange, but has to, in order to gain something of a cult-like audience. You could say the same about Hedwig, but that cult-like audience was earned. This one here? Not so much. And once again, it’s a shame. 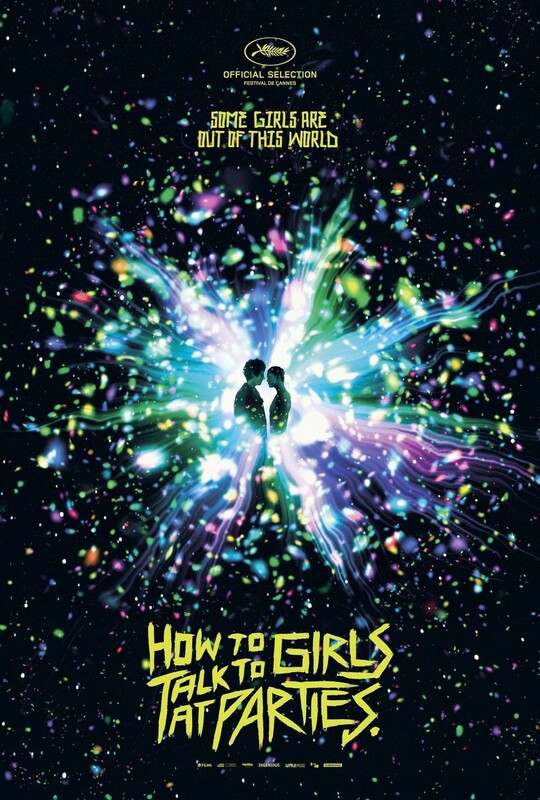 Consensus: Even though there is clearly a lot going on and it’s more than ambitious to fill at least five movies, How to Talk to Girls at Parties is a major disappointment coming from the fresh and fun voice of John Cameron Mitchell. I was looking forward for this. I liked the story this was based on, and I was hoping that the movie would be really good. Great review! I’m going to re-post it on my blog tomorrow, Thursday, May 31, if that’s okay with you.